Controller (F16v3) arrived yesterday. I hooked it up and got the test pattern running after a little over thinking. I am weeks or months away from hooking anything up to the house. Everything for now is being done on a workbench as I learn as much as I can. The one issue that is still causing the most headache is how to attach pixel bullet nodes to the high eaves of the house? The 2nd story eaves are out of my zone for a ladder. I want these to be a more permanent install where I only need to hire someone to put them up once and help bring them down for maintenance. I have seen people use J-Channel with the nodes pointing down and resting clean behind the fascia. I have seen people use conduit with Boscoyo Chromatrim zip tied. I do not want to have PVC hanging from these eaves all year. For the temporary parts of the display (around windows, garage doors, front door, etc), having those on PVC is not a big deal. Does anyone have any recommendations or ideas? I'll think about this. What material is your eaves made of? Fascia is wood. I think the soffits are wood as well. Depending on weather, I may be doing a small test tomorrow on the lower eave to see what may work. I have ChromaTrim arriving today. I can see what that looks like hanging under PVC. I will buy a piece of j-channel and see how that fits and works. I am trying to come up with ideas before spending a ton of money. The pixels are going to be expensive enough for Round 1. OK, I picked up a piece of j-channel, 1" PVC, and my ChromaTrim 3 arrived today. I didn't do anything with the j-channel. I did put the nodes I had at 3" spacing on the ChromaTrim. I really like that spacing. I think 2" would be too close for my liking. zip tying the Chromatrim to PVC is simple. All I would need to do is put PVC snap in clips on the backside of the fascia for a nice clean look. 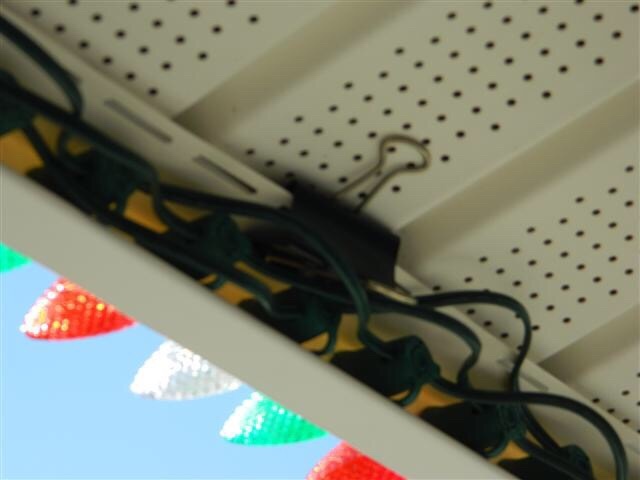 The PVC would be hidden and the Chromatrim hanging just below the eave line facing the street. Group joining buys for pixels can save $$. Mostly because the shipping is super high cost from China, or you pay markup from US sellers. We are doing pixel group buy here in Feb. Also check out the TASL meeting for Feb 9th.